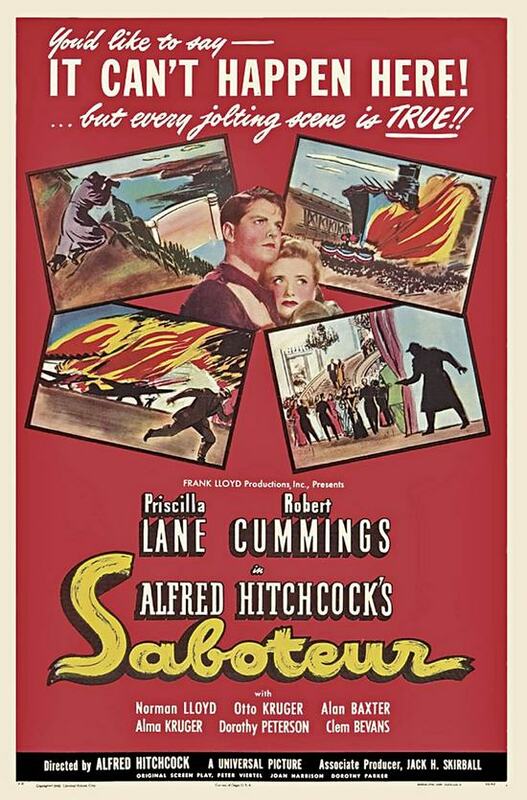 Tonight’s feature is SABOTEUR , directed by Alfred Hitchcock and starring Priscilla Lane, Robert Cummings, Norman Lloyd and Otto Kruger. 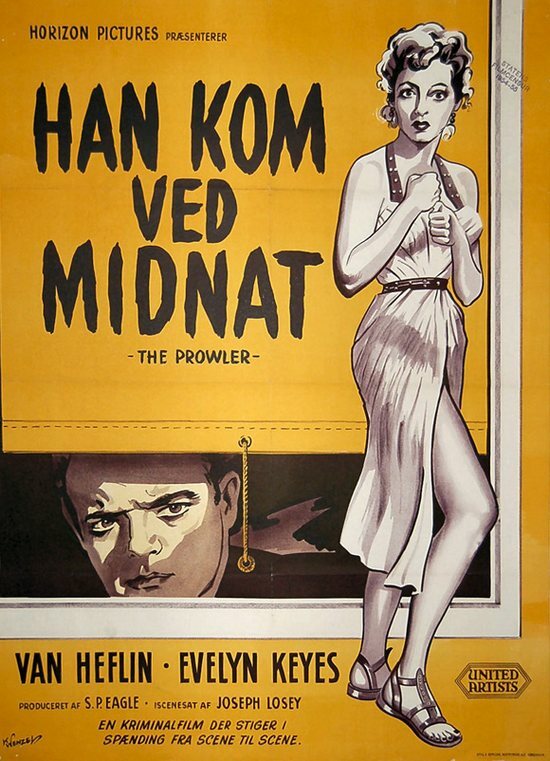 This is a fantastic WWII era thriller by the master of suspense. 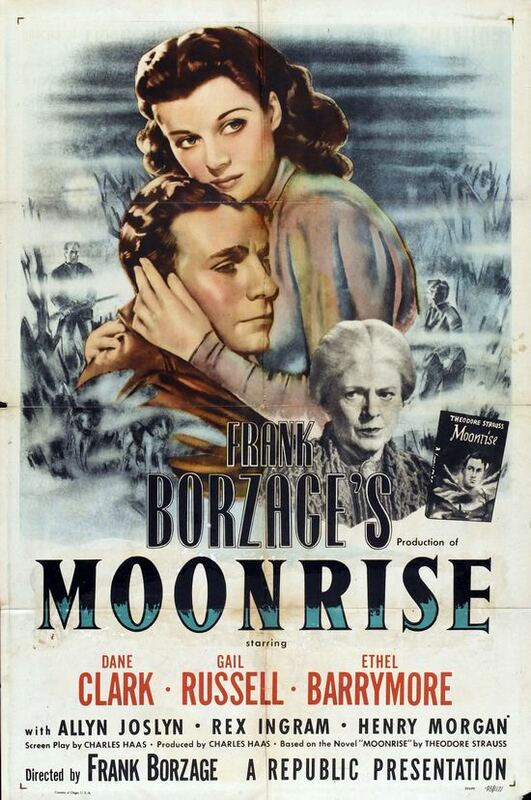 Munitions worker Barry Kane is falsely accused of setting fire to the Stuarts Aircraft Factory in Los Angeles, a fire that caused the death of his best friend, Ken Mason. Barry realizes that the real saboteur is Frank Fry, the man who handed him a fire extinguisher, which turned out to be full of gasoline. Remembering that Fry had an envelope addressed to him from the Deep Springs Ranch in Springfield, California, Barry goes there to find the killer, but the ranch’s owner, Charles Tobin, tells him that he does not know Fry. Tobin’s granddaughter, however, hands Barry a telegram addressed to Tobin from Fry stating that Fry is going to Soda City. Although Tobin has Barry arrested, Barry manages to escape from the police by jumping off a bridge. One of my readers, Regina, asked me what happened to Dr. Westlake after he was paroled from San Quentin in 1944. I decided to do a bit of digging and I found his San Quentin photo–a notation indicates that he died while on parole in February 1950. Captain William Bright and the homicide squad understood the importance of circumstantial evidence in winning a conviction in a murder case. They met with Assistant District Attorney Jordan and for hours they reviewed everything that they had assembled in the case against Dr. Frank Westlake. The foundation of the case against the doctor was greed. He had in his possession deeds of trust for several lots, bank books and cash belonging to Laura Sutton. He was the beneficiary of a life insurance policy she had taken out and he had even given some of Laura’s personal belongings away–hardly the actions of a man who thought she’d be home soon. 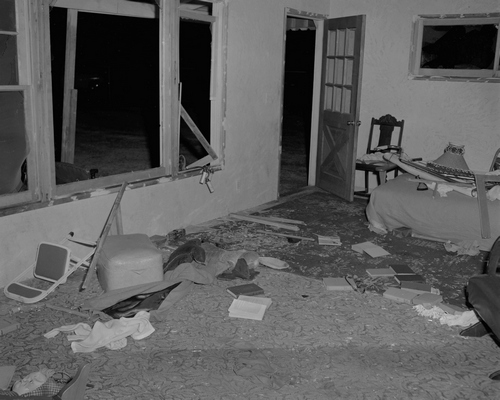 The evidence implicating Dr. Westlake in Laura’s murder was circumstantial, but when taken together it offered a compelling argument for murder committed for personal gain–particularly when her clothing, silverware, and other personal effects were discovered by deputies concealed under the floor and in the attic of his home. They found a typewriter hidden under a pile of clothing too. It was the possibly the same typewriter that had been used to write the so-called “birdie letters”. The letters were purportedly sent by Laura to Westlake inquiring about her pet canaries and some of her other belongings. What did you do with the furniture and the birdies? If stored, where? Is Mr. King still in town, and what shift is he working? Please answer these questions in any of the personal columns. Will see you soon. 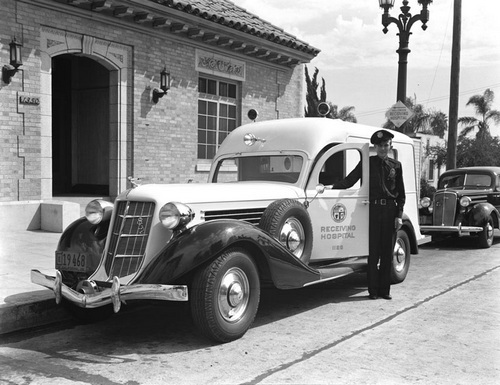 An inquest conducted by Coroner Nance was held on June 13, 1929. 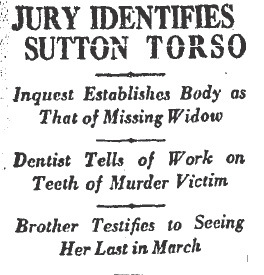 The primary reason for the proceeding was to get on the record the identification of the torso as Mrs. Sutton’s so that the murder trial could go forward. There was no doubt in any of the investigators or scientists minds that the torso and head belonged to Laura. 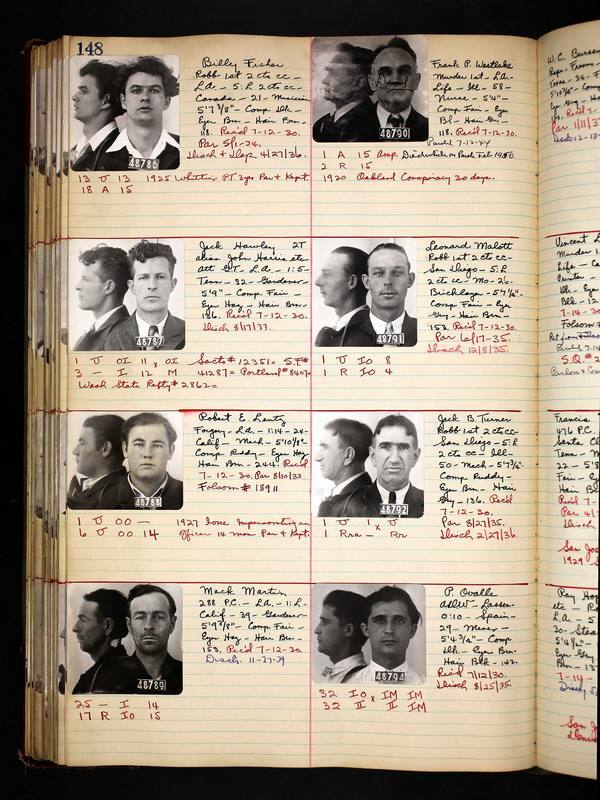 The sensational murder trial of Dr. Westlake was scheduled to begin on August 19, 1929; however, Westlake’s legal team was wrapping up another case so the trial was continued until August 26th. The case against the doctor was simple. The State alleged that he had murdered Sutton so he could gain control of her assets, and then he mutilated her corpse to cover up the crime. Nine women and three men were selected to pass judgement on the 57-year-old retired physician. The 8-year-old boy who had found the torso was a witness, as was the 14-year-old boy who had discovered the head. Due to the condition of the body (still armless and legless) the testimony was necessarily scientific. The jury was schooled in the rudiments of forensic odontology so they could understand the dentist’s testimony. Further, bones from the torso were entered into evidence so Dr. Wagner, the autopsy surgeon, could explain how it was possible to determine the age of the victim by the ossification of her bones. Thirty-six hours after beginning their deliberation the jury returned a verdict of guilty and fixed Dr. Westlake’s sentence at life in prison. One of the jurors said that they’d have brought in a guilty verdict on the first ballot if not for one of the women members who declared that she was a psychologist and from her observations deduced that Westlake was probably not the killer. Apparently she regained her senses. The conviction of Dr. Frank P. Westlake for the murder of Laura Sutton, in the so-called torso murder case deserves the highest commendation of this office. It is with deepest satisfaction that I desire to commend Captain Willikam J. Bright of the homicide department and his able deputies, Allen, Gray, Croushorn and Gompert for their diligent and skillful efforts in marshalling the evidence upon which a conviction was obtained. Their unceasing efforts solving what began to look like a baffling murder, have ultimately been rewarded by a just and conclusive verdict of first-degree murder after a fair and impartial trial. We are turning over to the family of Mrs. Sutton at the request of Mr. Sutton, the husband, and the brothers and sisters, the body for burial by them, which signifies the satisfaction of the family at the identification of the torso. In this era of DNA evidence we have a tendency to take for granted the skills required to investigate crime outside of the laboratory. Even with the quantum leaps in scientific techniques an investigation is only as good as the men and women who conduct it. What happened to Dr. Westlake? 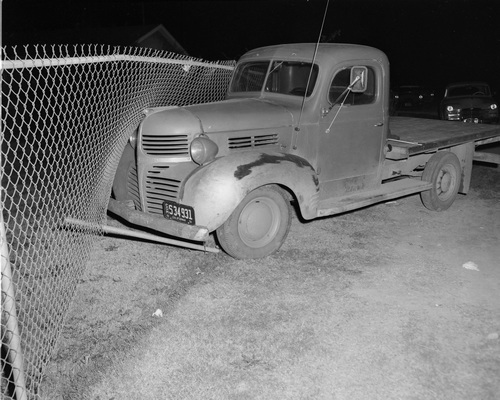 He was paroled on July 12, 1944 after serving only fourteen years in San Quentin for the murder of Laura B. Sutton. NOTE: Many thanks to my friend Mike Fratatoni for bringing this deranged case to my attention. Captain Bright and the homicide squad had no shortage of suspects in Laura Sutton’s murder. Her ex-husband, Eugene, may have wanted her dead so that he could stop paying alimony. Laura and her sister Ida had been estranged because of Ida’s relationship and pending marriage to Eugene. Letters written by Laura to Eugene had been discovered, and in them she expressed her desire to start over with him. 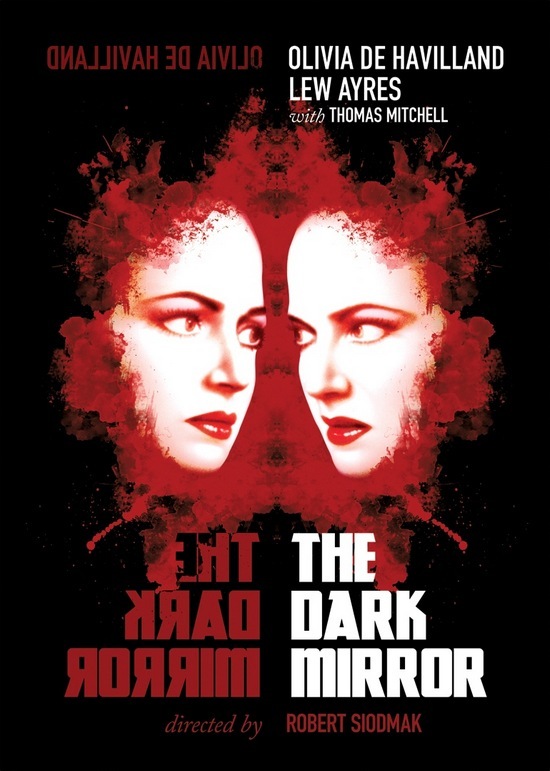 Together, or separately, Ida and Eugene may have murdered Laura. Then there was Ben King who rented a room in Laura’s house. Apparently Ben had been courting Laura–but so had Dr. Westlake. What if Ben became so jealous of the doctor that he murdered Laura rather than lose her to another man? Even Laura’s brother Emerson De Groff may have had a motive–he was supposed to inherit some land, maybe there was more than just an unrecorded deed at stake. Lastly there was Dr. Frank Westlake. He was the only one of the suspects with a knowledge of human anatomy, and probably the only one who owned a scalpel. One of the basic tenets of a homicide investigation is cui bono. Who benefits? Which of the suspects stood to gain the most from Laura’s death? Homicide investigators collected a lot of circumstantial evidence, all of which pointed to Dr. Frank Westlake. Westlake had deeds to many of Laura’s properties, large sums of her cash and her bank books. He had been named as a beneficiary in her will and in a life insurance policy. Oh, and remember the missing Liberty bonds? Westlake had those too. Apparently Dr. Westlake had been acting as Laura’s financial adviser for six years, long before her divorce from Euguene. Following the divorce Westlake had taken complete charge of Laura’s finances and had convinced her to open a joint bank account with him. She deposited $750 –the doctor hadn’t contributed a dime. Detectives quizzed Ben King.. 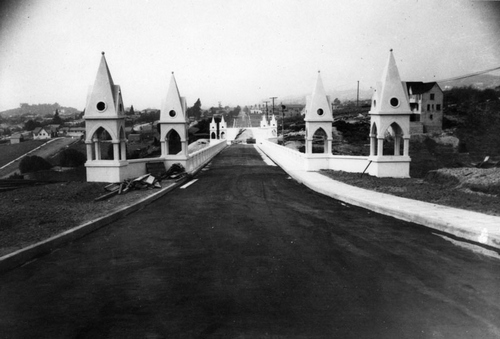 He said he had proposed marriage to Laura–a union to which Westlake was vehemently opposed. An argument broke out among the three of them and, according to King, Laura grabbed a pistol and held it to her head. That’s one way to end an argument. King relieved Laura of the weapon and later gave it to Westlake. He said the argument had occurred on March 26th and that he had never seen Sutton again. Dr. Westlake’s initial statement to detectives was that Laura had summoned him to her house several days following the argument. She wanted a lift to the train depot where she could catch a train for Ventura. She planned to confront Eugene and Ida. According to the doctor his car broke down at Pico and Union and Laura got out and caught a street car. He never saw her again. Westlake’s story fell apart in some crucial ways. The letters supposedly written to him by Sutton were determined to be forgeries. Then there was the note for $200 which he claimed had been endorsed by Laura on the 3rd of April and mailed from a small Arizona town. Again the experts said the signature was a forgery. Dr. Westlake enlisted the aid of Ben King, asking him to keep a vigil at the cemetery where Laura’s mother was buried. Both men knew that Laura visited the grave several times a week and decided that she might turn up there. For an entire week Ben pulled all night graveside stakeouts. Westake didn’t participate, but he regularly drove out to the cemetery to visit with King and to encourage him to stay. 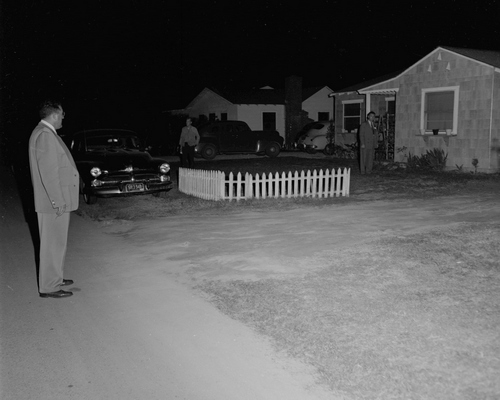 Detectives were further troubled by the murkiness of Dr. Westlake’s past. The doctor claimed to have graduated from the Eclectic Medical School in Cincinnati in 1900. 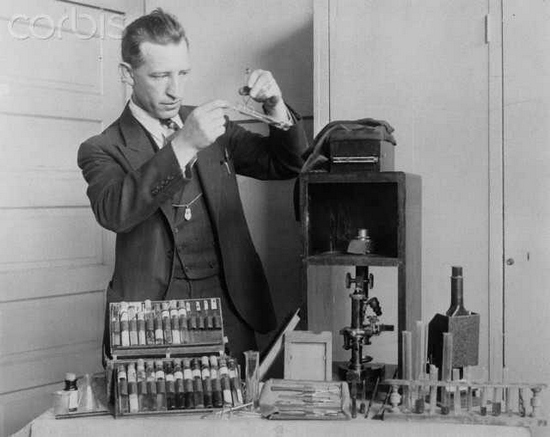 Eclectic medicine relied on botanical remedies and was the antithesis of modern Western medicine as practiced in the 18th and early 19th centuries. California didn’t recognize medical degrees from the Eclectic Medical School so Dr. Westlake was not permitted to practice here. Circumstantial evidence against Dr. Westlake continued to accumulate, but what Captain Bright wanted most was a crime scene. Every member of the homicide squad was dispatched to locate the scene of the murder and dismemberment. While seeking the crime scene Sheriffs discovered that a home had been rented during the last week of March by a couple who resembled Westlake and Sutton. The couple had paid two months’ rent in advance. When he was questioned about it Westlake admitted that he and Laura had been “house hunting” for several days before she disappeared and had visited at least eight vacant homes in the Edendale district, all of which would need to be searched. Deputy Sheriffs Allen, Gray and Gompert found bloodstains splashed all over the walls and floor in the bathroom of Dr. Westlake’s home. They had the bathtub removed and the “gooseneck” in the pluming was tested. Gompert’s portable crime lab came in handy. The blood in the bathroom “forged the final link in a chain of circumstances” which the D.A. felt were compelling enough to formally charge Dr. Westlake with Laura Sutton’s murder. The evidence against him didn’t seem to bother Westlake. He denied harming Laura and, in fact, insisted that she was still alive. 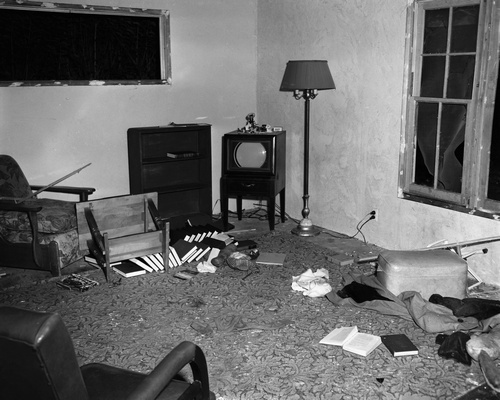 NEXT TIME: The conclusion of the L.A. River Torso Slaying. Captain Bright’s faith in his detectives and the crime lab wasn’t misplaced. Six weeks following the discovery of a woman’s torso in the Los Angeles River partial identification of the victim was made through her teeth. 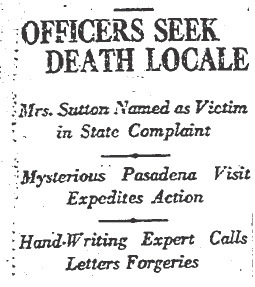 The dead woman was tentatively identified as Mrs. Laura B. Sutton. She was 40 years of age and had mysteriously disappeared at the end of March–six days before the torso was found. Mrs. Sutton’s brother, E.J. 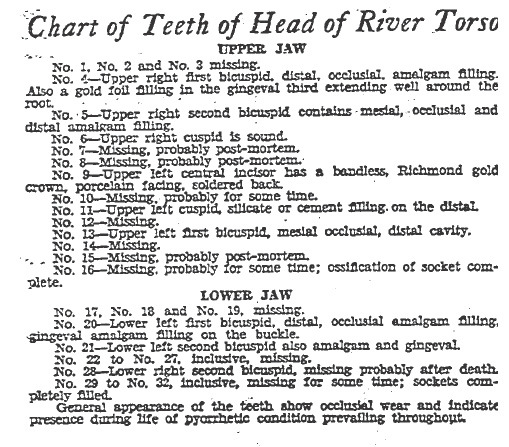 Groff, had seen the drawings of the teeth in the newspaper and immediately contacted his sister’s dentist. 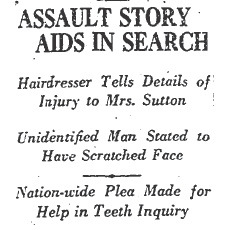 While the doctor wouldn’t go so far as to state positively that the teeth were Mrs. Sutton’s, he was willing to say that they closely resembled them–he would need to make a trip to the Coroner’s Office to make a positive match. Unfortunately, his trip to the see the skull would have to be delayed until he could find Sutton’s x-rays, which he had misplaced. She made no effort to explain herself further. Then she told him that two Liberty bonds had been stolen from a safety deposit box. Apparently whoever took them had slipped a sharp instrument into the envelope in which they were kept, removed the bonds, then resealed the envelope so carefully that nobody would have noticed if they’d merely glanced inside the box. Groff provided the name of a man he felt could be responsible for the missing bonds, and for his missing sister. The detectives wouldn’t give out the man’s name until they’d had an opportunity to investigate further. There were the usual false leads in the investigation; a hair sample taken from the skull and compared with hair found in Mrs. Sutton’s house seemed to indicate that the torso wasn’t hers. But then detectives interviewed Sutton’s hairdresser who told them that the missing woman had been attacked in mid-March, just a week or two before she went missing. The hairdresser said Sutton had told her she didn’t recognize her attacker, but she could have been concealing his identity for reasons of her own. Perhaps the attack was the result of a failed love affair. Until they could get confirmation from Sutton’s dentist, Sheriff’s investigators continued to run down clues. They wanted to speak to Eugene Sutton, whom Laura had divorced in 1928. As an ex-spouse, behind in his alimony payments, Eugene was a person of interest. While the detectives followed various leads the Coroner’s office reported that a minute examination of the knife marks on the toro where the head and limbs had been severed had produced results. The body had been dismembered by someone familiar with human anatomy and a surgical knife had probably been the tool used. An examination of the flesh suggested to the coroner than the murderer had a practical knowledge of surgery. The autopsy surgeon, Dr. Wagner, estimated that the killer would have needed about three hours in which to complete the gruesome task. Dr. Frank William Westlake, retired physician and a former suitor of Mrs. Sutton’s, came forward to make a detailed statement to Captain Bright. Westlake said that he saw Laura on March 28th when she came to him saying that she planned to travel to Ventura for a few days to see her ex-husband about the unpaid alimony. According to Westlake, Laura had left two pet birds in his care. Laura’s sister, Mrs. Ida Kleppe, was questioned by Sheriff’s detectives but she couldn’t offer much help. She said that she and her sister had been estranged for several years. Round-the-clock efforts to either find Laura Sutton, or conclusively identify the torso as hers, consumed both detectives and scientists. Captain Bright got another visit from Dr. Westlake who brought with him several notes signed with the initials L.B.S., which he said were from Sutton. The notes were a mixed bag. Some of them were in envelopes and others had been stuffed into Westlake’s mailbox. Some had been typed, others handwritten, and each of them made reference to the pet canaries in Westlake’s care. The notes could provide useful information, but first they would have to be examined by handwriting experts to determine their authenticity. If Laura Sutton had written the notes then why hadn’t she come forward? The woman had been missing for nearly three months. Neither her friends, nor her family, could offer any explanation for such peculiar behavior. While detectives were following leads and the scientists were examining physical evidence, deputies where searching the river bottom from Vernon to Compton for the still missing limbs. They were also preparing to rip out the plumbing in Laura’s house to see if there was any physical evidence of a murder and dismemberment lodged in the pipes. The scientists had found another interesting avenue of inquiry–the ears of the deceased. 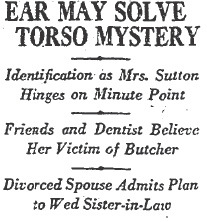 According to those who knew her Laura’s ears had been pierced for earrings, but the ears on the head were intact. The case became further complicated when Laura’s attorney, Willard Andrews, perhaps the last person to see her alive, came forward with a statement that was mind-boggling. Laura told him she intended to find her ex-husband and her sister, Mrs. Kleppe, and “have it out with them.” Why? Because her sister and her ex were having an affair–in fact it was the reason for the divorce. No wonder Laura and her sister were estranged. Even worse, her sister and her ex-husband planned to marry. Talk about awkward family gatherings. From virtually nothing to go on Sheriff’s investigators suddenly had suspects and physical evidence galore, all they had to do was to make sense out of it. On May 28th an x-ray of the victim’s ears showed that they had been pierced but that they’d healed over so that the holes weren’t visible to the naked eye. The x-ray evidence was a step in the right direction–then the dentist, E.C. 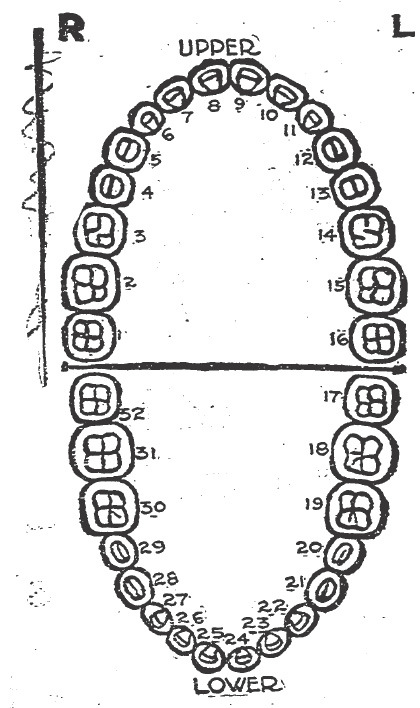 Hyde, positively identified the teeth in the skull as Laura Sutton’s. By May 30th Captain Bright and his detectives had finally narrowed their list down to a single suspect. Who? Wait and see. NEXT TIME: A suspect is named.